Astronomers using the NASA/ESA Hubble Space Telescope have found the most distant star ever discovered. The hot blue star existed only 4.4 billion years after the Big Bang. This discovery provides new insight into the formation and evolution of stars in the early Universe, the constituents of galaxy clusters and also on the nature of dark matter. The international team, led by Patrick Kelly (University of Minnesota, USA), Jose Diego (Instituto de Física de Cantabria, Spain) and Steven Rodney (University of South Carolina, USA), discovered the distant star in the galaxy cluster MACS J1149-2223 in April 2016. The observations with Hubble were actually performed in order to detect and follow the latest appearance of the gravitationally lensed supernova explosion nicknamed “Refsdal” (heic1525), when an unexpected point source brightened in the same galaxy that hosted the supernova. The observed light from the newly discovered star, called Lensed Star 1 (LS1) was emitted when the Universe was only about 30 percent of its current age — about 4.4 billion years after the Big Bang. The detection of the star through Hubble was only possible because the light from the star was magnified 2000 times. “The star became bright enough to be visible for Hubble thanks to a process called gravitational lensing,” explains Jose Diego. 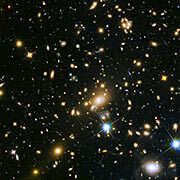 The light from LS1 was magnified not only by the huge total mass of the galaxy cluster, but also by another compact object of about three times the mass of the Sun within the galaxy cluster itself; an effect known as gravitational microlensing . “The discovery of LS1 allows us to gather new insights into the constituents of the galaxy cluster. We know that the microlensing was caused by either a star, a neutron star, or a stellar-mass black hole,” explains Steven Rodney. LS1 therefore allows astronomers to study neutron stars and black holes, which are otherwise invisible and they can estimate how many of these dark objects exist within this galaxy cluster. As galaxy clusters are among the largest and most massive structures in the Universe, learning about their constituents also increases our knowledge about the composition of the Universe overall. This includes additional information about the mysterious dark matter. “If dark matter is at least partially made up of comparatively low-mass black holes, as it was recently proposed, we should be able to see this in the light curve of LS1. Our observations do not favour the possibility that a high fraction of dark matter is made of these primordial black holes with about 30 times the mass of the Sun”, highlights Kelly. After the discovery the researchers used Hubble again to measure a spectrum of LS1. Based on their analysis, the astronomers think that LS1 is a B-type supergiant star. These stars are extremely luminous and blue in colour, with a surface temperature between 11 000 and 14 000 degrees Celsius; making them more than twice as hot as the Sun. But this was not the end of the story. Observations made in October 2016 suddenly showed a second image of the star. 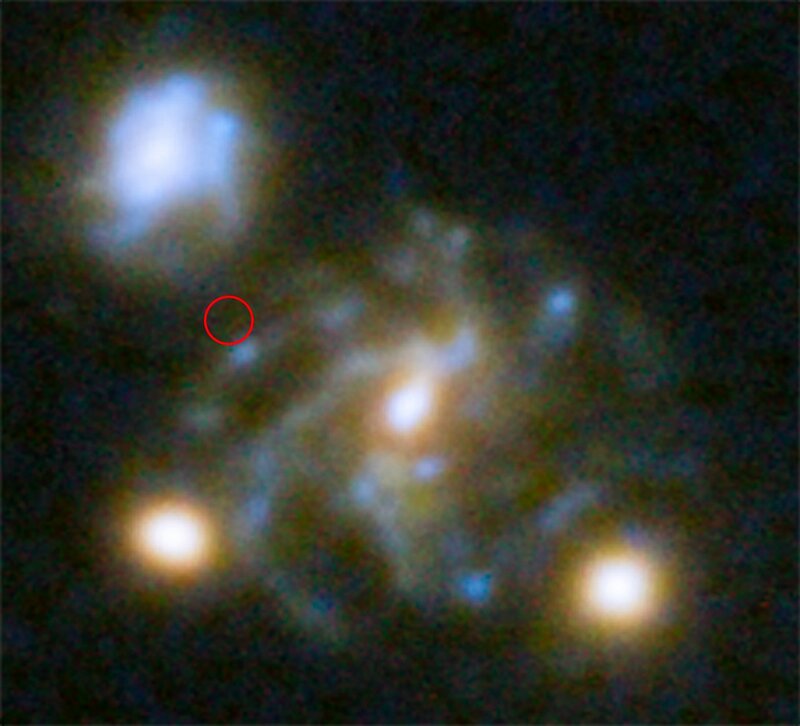 “We were actually surprised to not have seen this second image in earlier observations, as also the galaxy the star is located in can be seen twice,” comments Diego. “We assume that the light from the second image has been deflected by another moving massive object for a long time — basically hiding the image from us. And only when the massive object moved out of the line of sight the second image of the star became visible.” This second image and the blocking object add another piece of the puzzle to reveal the makeup of galaxy clusters. 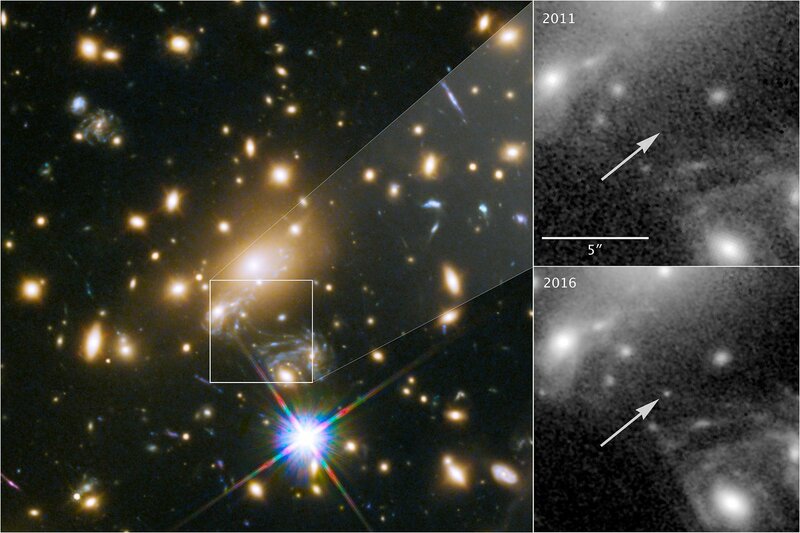 With more research and the arrival of new, more powerful telescopes like the NASA/ESA/CSA James Webb Space Telescope, the astronomers suggest that with microlensing, it will be possible to study the evolution of the earliest stars in the Universe in greater detail than ever expected. Observations of this supernova, nicknamed Refsdal in honour of the Norwegian astronomer Sjur Refsdal, were made as part of Hubble’s Frontier Fields project. 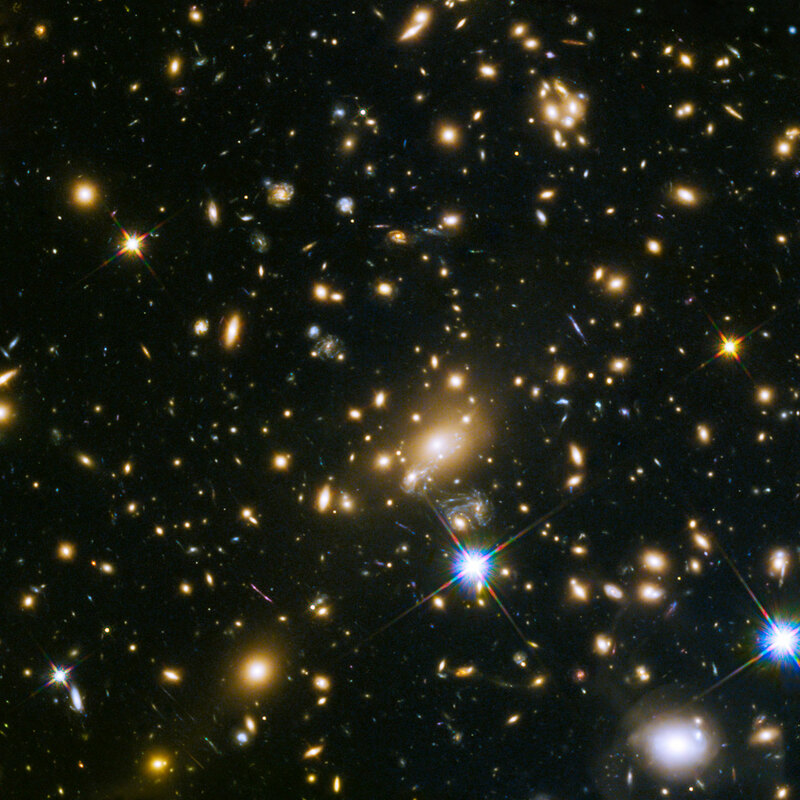 Gravitational lensing magnifies the light from fainter, background objects, allowing Hubble to see objects it would otherwise not be able to detect. The process was first predicted by Albert Einstein and is now used to find some of the most distant objects in the Universe. Usually the lensing object is a galaxy or a galaxy cluster, but in some cases it can also be a star or even a planet. When it involves these smaller objects the process is called microlensing. The results were released in the paper Extreme magnification of an individual star at redshift 1.5 by a galaxy-cluster lens to be published in Nature Astronomy.